That’s a question I’ve been wondering about lately as we explore about the culture of the tour rider. 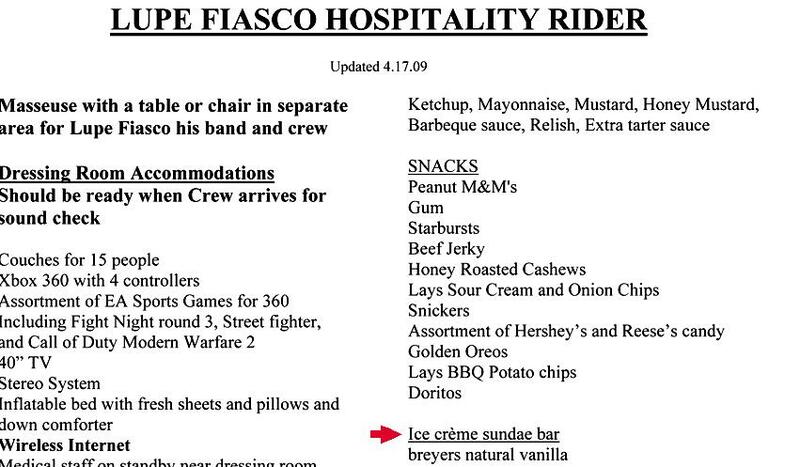 The excerpt in the photo above comes courtesy of the Smoking Gun who recently posted the tour rider for one of my favorite hip hop artists Lupe Fiasco who apparently loves to have ice cream sundaes backstage for every show. Besides Fiasco’s, I’ve also been diving into the Smoking Gun’s extensive collection of other tour riders that features interesting requests from Neil Diamond, Kayne West, Gnarls Barkley and dozens of others from the past and present. In case you’re new to the whole thing, the basic reason behind these tour riders is that they are a contractual aggrement between the venue, promoters and artist. And if one of the detailed requests aren’t met then the artist has the right to refuse to play that show. Now, I’m sure you’ve all heard about the famous Van Halen rider that requested a bowl M&M’s, minus the brown ones, be place in a glass bowl in their dressing room. But what’s interesting about the culture of the tour rider is that it’s not as simple as saying an artist is demanding these things just because they can. There’s apparently a safety and security-based thought process behind the seemingly outrageous requests. The objective of the [tour rider] wasn’t due to any excesses on the part of the band, but was a method to determine how much attention to detail the crew at a local venue paid to the requests specified in the rider. Should the bowl be absent, or if brown M&Ms were present, it would give band members reason to suspect other, legitimate, technical and safety issues were also being performed poorly or were outright overlooked. David Lee Roth stated in his autobiography that this request was done as a result of faulty workmanship at a venue on an earlier tour which nearly cost the life of a member of Van Halen’s road crew, as well as $85,000 damage to the venue and their own equipment. When you consider that perspective it certainly makes you think of these tour rider requests differently, especially in the wake of the Sugarland stage tragedy. Of course, leave it to the Foo Fighters to create a tour rider coloring book for their current tour. And take a look back a brief history of “wine-inspired” tour riders in this gallery via Snooth. But, really, how many of these requests are for safety reasons, and how many are just to indulge hedonistic pleasures? Are artists really trying to protect themselves against careless venues and lazy promoters? Whether they get met or not, I wonder how these rider requests impact the fans? Those are questions that we’re going to explore as we continue to dive deeper into this most interesting tour rider topic. Until next time, we’d love to hear from about this. What’s Your Take on Tour Riders? Are they a joke? Are they legit ways to keep an artist safe during a show? Let us know what you think and we’ll share your feedback during a future episode of Live Fix Radio. What If…There Was A Street Performer Supergroup World Tour?